Preheat the oven at 200° C .
Rub salt on both side of the salmon fillet. 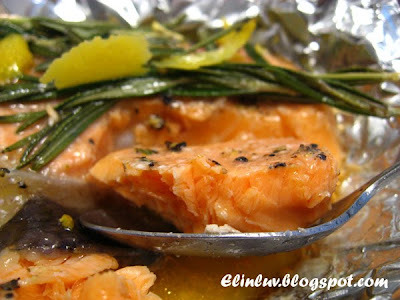 Place the salmon on a plate lined with a piece of aluminium foil . 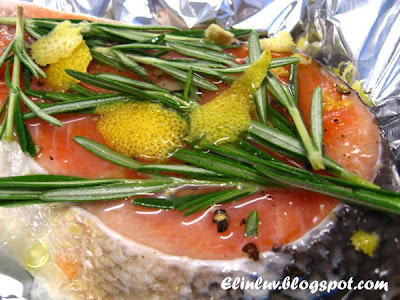 Add the black pepper, lemon juice and lemon rind on the the surface of the salmon. 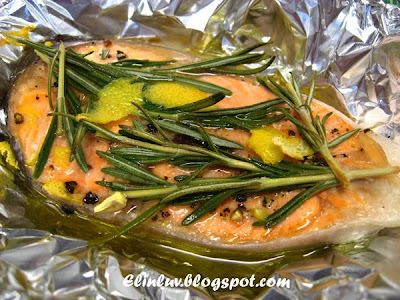 Place the fresh rosemary on top and drizzle olive oil generously on the salmon. Put in the oven and bake for 10 minutes or till cooked. Served it hot with brown rice. 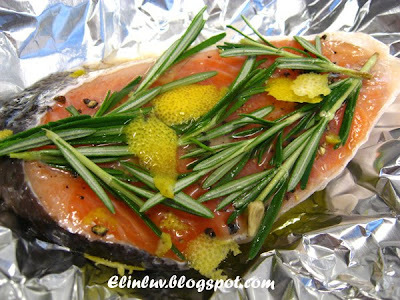 unless one has dined well "
rosemary.. ok,ok, tomorrow take me to go buy this and i wanna try to bake it like u... very nutritious, my girl loves salmon but it is getting more and more expensive..
Salmon makes me happy too!! Looks yummy. I love salmon too. Both of us use almost the same method but I like to add extra garlic on it. We love salmon in our family, too. 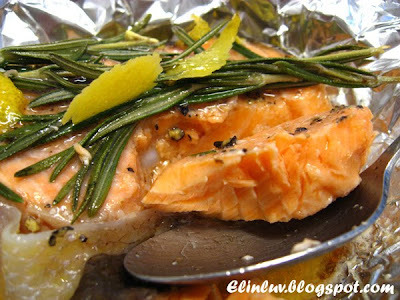 I've tried almost every way of cooking with salmon ... except Rosemary ... looks delicious! During summer time, we love to make pesto and top it on our salmons ... Yum! I love salmon cooked in any style..this rosemary scented salmon steak looks terrific! looks perfectly cooked! A great way to enjoy salmon. Yummy ..... must get some from JJ too if it's this price. @ Tasty Trix : :)) same..it makes me HAPPY too ! @ Anncoo : yup..salmon goes well with these ingredients...fresh herbs ,garlic, parsley and lemon juice ! @ pigpigscorner : I like it this way...just cooked...mmm delicious! @ Joy : Hi Joy, you are welcome.